Ditko's final year on Doctor Strange is some of his best work ever, 10-page segments of pure magic every month. "Beware...! Dormammu Is Watching" is right in the heart of that run, a great chapter in the saga. As Strange returns from his quest for Eternity, he finds that Mordo, working for and powered by the Dread Dormammu, has taken the Ancient One prisoner. What follows is an epic magical battle, while Dormammu, the Ancient One and the as-yet-unnamed Clea look on, amazingly drawn by Ditko. 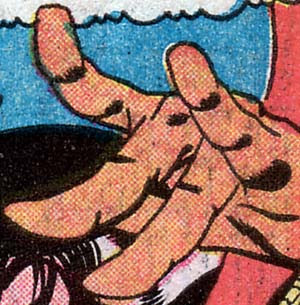 As you can see by the choice of close-up scans, one of the things I love about this story is the way Ditko would draw hands, especially of anyone engaged in casting magic spells. I don't believe in magic, but I know in my heart that if it did exist, it would have to be accompanied by hand gestures straight out of the Ditko playbook. 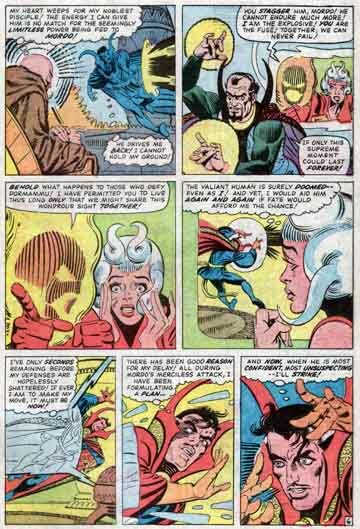 Lots of other classic Ditko bits in this page, from that weird hair on Clea, and the worried look on her face to the disheveled hair on Doc in the last panel. I think I even catch a hint of a Ditko sneer on Dormammu in the third panel, and that's an impressive thing to manage with that character design. some really great stuff in this period by Mr. D. The page itself is excellent, with wonderful poses, expressions throughout. I think I'm going to have to re-read these books soon. Don't you ever wonder how all that funky handwork by rappers and heavy mettalists derives from Ditko? Especially all those horned devil spell hands. How does something like that start anyhow? 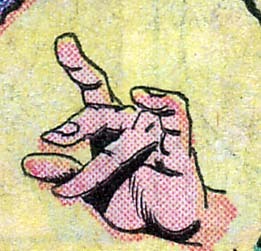 It's weird - I was just thinking today that it's a pretty awesome coincidence that Steve Ditko used hand gestures in Dr Strange that are exactly like the hand positions used by Chinese martial artists and Chi-Kung practitioners to stimulate the flow of chi through the body's meridians. Check out Gordon Liu's hand gestures in RETURN TO THE 36th CHAMBER (1978) -- you see him pressing his first finmger and thumb together whikle extending his remaining fingers. Just like a Steve Ditko drawing! I think the nearest thing we have to magi in the real world is Chi-Kung. It's amazing how similar the effects of Chi-Kung and, say, a bible-thumping "healer" on their subjects is. as a kid i loved mr ditko's work,you re so right about his wonderful work in that period (tho cronology in my country was messed up ,causing some funny sincronicity accidents...)i also loved colan's and smith's episodes a lot. giorgiopicker, only an old time fan passin' by. just found out this is a 2006 page.. I'll check the rest!